I said in my last post that I agreed with Top Gear’s conclusion saying the Transfagarasan road was better than the Stelvio pass, but that did not mean that it was the road I enjoyed most in my trip. That honor will have to go to the journey we did today on our way from Sta. Maria to Interlaken, which took us across no less than five passes. We started climbing the first one right after leaving Sta. Maria, it was the Ofenpass, and at that time in the morning there was no other traffic on the road. It might not have been as visually spectacular as the Stelvio, but as a road to enjoy on a motorbike it was perfect. Fast corners, nice landscape, Swiss-quality tarmac… roads do not much better than this. We made it to the other side with the tank almost empty, so we stopped at a petrol station in the first town we found. There were quite a lot of bikes queuing there, and it seemed that there was nobody in charge of the pumps or in the register, we had to use a credit card or bank notes to pay for the petrol. Several bikers, including ourselves, tried putting different cards into the machine, which rejected them all, and it would not take anybody’s bank notes either. Frustrated and practically running on fumes, we went on, hoping to find another petrol station before turning right for the next pass, which was quite near. I programmed the GPS to look for one – this is one of the most useful you can do with it – and it led us to one a few meters from the start of the road up the pass. 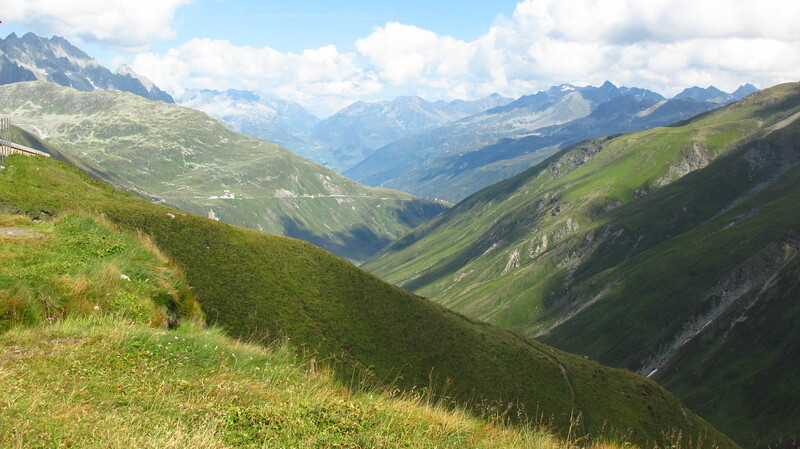 With the tank full, we started climbing the next pass, the Albulapass, which took us to the Chur area. From there on the road was a tad more monotonous, nice and widing, through beautiful landscape, but without the excitement or views of the passes and with a lot more traffic, as it was a main road. The longuish ride to the next three passes before Interlaken was made a bit more entertaining by a long caravan of classic cars we met, closed by a black Ferrari 575 which provided an excellent soundtrack to go with the views. We stopped before starting to climb the following pass, the Oberalpass, and I had a can of energy drink to keep me going, as it was turning out to be quite a long day. It was sunny and warm, the roads were excellent and we were not going to cover a lot of kilometres to Interlaken, but riding on such fun roads was exhausting and we had three more passes to go. Shortly after the Oberalpass we started climbing the Furkapass and the Grimselpass, which were one right after the other. On the way up the first one we saw some thick black smoke coming up from the bottom of the deep valley. We stopped to take some pictures a few corners further up the road and saw it was an old steam train painfully making its way up the valley. It was progressing very slowly, belching out a thick column of smoke. We stopped for lunch at the top of the pass and saw it again nearing the entrance of the tunnel that would take it to the other side of the mountain, far below us. I had been thinking that it had to be a great experience to ride those mountain railways in an old tourist steam train, but seeing how much smoke the engine was making as it entered the tunnel I thought it would not be so much fun for the passengers to breathe soot for the length of the tunnel. We had lunch on a grassy knoll overlooking the road, admiring all the exotic metal driving past on both directions – you name it, we saw it. From the usual selection of Ferraris, Porsches and Lamborghinis to Lotuses, Caterhams, TVRs, and some kit cars I was not able to identify. As for the motorbikes, there were hundreds of GSs, you would think they are cheap to buy, seeing how many populate the roads all over Europe! The road took us down a deep valley where we saw an old train station where the line coming from the valley ended and passengers switched to the old steam trains for the reminder of the way up. The road down from the top of the Furkapass kept crossing the train line, and once at the bottom it almost immediately started climbing again for the Grimselpass, the last one before Interlaken. From the beginning of the last section of the Furkapass we got a privileged view encompassing the railway going down to the bottom of the valley, the station, the road up the next pass and even a glimpse of the lake at the top of it, all in glorious late afternoon light. We went past another lake on the way down from the Furkapass, on a road that offered yet more gorgeous views for what was the last bit of our ride in the heart of the Alps. After all these marvellous rides, I can come to my own personal conclusion and choose the road traversing the Furkapass and the Grimselpass as the best road I have ever ridden. I am aware that I missed other great names, such as the St. Gothardo pass or the St. Bernardino pass, but we just did not have the time to properly explore the area. Well, that will be the excuse to come back here in the future. 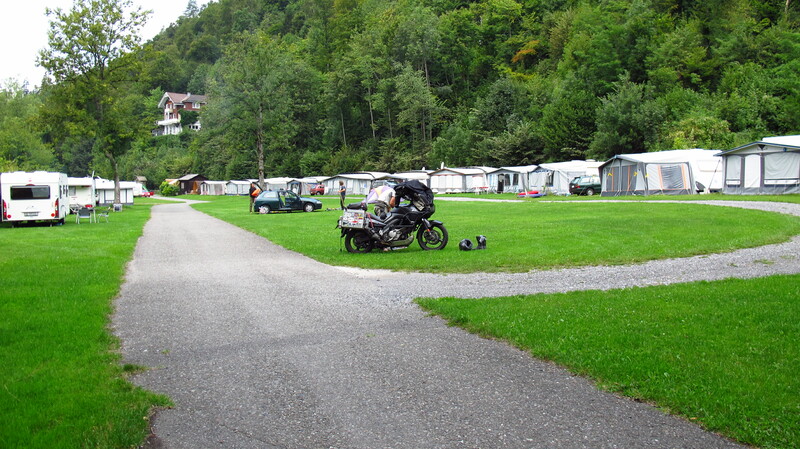 We stopped in a town called Innertkirchen to do some shopping for dinner and then rode the last few kilometres to Interlaken, where it did not take us long to find a great campsite right by the canal connecting both lakes, within walking distance from the city center. This entry was posted in Stroming The World 2013, Travel and tagged Albulapass, Furkapass, Grimselpass, Interlaken, Oberalpass, Ofenpass, Santa Maria, STW 2013, Switzerland by Kilian. Bookmark the permalink.